Scottish Borders Council want reimbursed for repairs made following damage caused by the construction of the Borders Railway. The head of Scotland's Economic Development Agency is backing an expansion of the Borders Railway. The benefits are definitely economic in the Borders and that was underestimated at the time. So certainly that's a great thing in terms of bolstering the case for further investment into the rail. I mean, I've spent all my life in investment and I look at things and say if it works, we should do more of it. If it doesn't work, we shouldn't do it. This has clearly work, and is working, and can work even better." Three councils in Scotland are hosting a consultation to find out how they can better help local businesses as part of the development of the Borders Railway line's 'wider corridor'. Edinburgh, Midlothian and Borders Council are working together as part of the Borders Railway Blueprint Partnership. The councils say they wish to speak to local businesses on how they can best support their "growth ambitions", including by possibly developing an incubation space close to the new stations. The survey can be accessed here and will close on Friday 28 July at 5pm. More information can be found on the Borders Chamber of Commerce website. A £1.6million legal case is about to get underway over damage caused during the construction of the Borders Railway. Scottish Borders Council have launched the compensation claim against Network Rail for the repair of roads, bridges and walls which were damaged during the building of the £300million line. It is understood talks at a resolution with Network Rail broke down with several matters still in dispute. The claim is for various points of damage inflicted on and around the A7 corridor north of Galashiels, said to have happened in the weeks before the railway opened in September, 2015. A hearing is due to take place at Selkirk Sheriff Court tomorrow. An independent study says the railway "is attracting new tourists, homeowners and workers" to the Border region. The Summary Case for a New Cross-Border Rail Link report details potential extension plans for the rail route across the Borders. Campaigner Madge Elliot MBE from Hawick visited the Scottish Parliament today as her story was revealed as part of a new exhibition. Madge Elliot was at the forefront of the campaign to reopen the Waverley line, which lead to one train being named after her in 2015. She also founded the Campaign for Borders Rail. John Lamont MSP said the exhibition pays tribute to the hard work that brought back part of the Waverley line. Madge has visited the Scottish Parliament a number of times to push for the new line and it was down to her hard work that the legislation was passed to begin the process of reopening the railway. While the results of her efforts have been great, Madge agrees with the need to continue to press for the line to go on to Hawick, her home town, and beyond. Very fittingly, Madge took the train to the Parliament and said she was very impressed with the service. 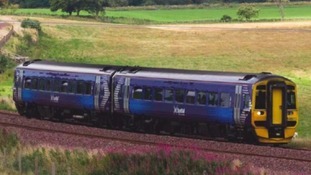 An across-the-board increase in tourism statistics in the Scottish Borders is being attributed to the new railway line. A new video showcasing the best of the Scottish Borders has been created by Visit Scotland. It's part of a three-year campaign to market the Borders Railway internationally, and put the new 100-mile track on the map. This video is specifically geared towards attracting more visitors from the United States. At Visit Scotland we've identified the US market as our biggest single market. We're doing the video to attract people to show them the stunning scenery that's available in the Borders and some of the attractions across the region."